We are not a food and beverage distribution company; we are a people company. We’re proud to deliver our products to dozens of great communities, and we continue to live our mission by bolstering and supporting people where they work, live, and play. We’ve built the Bernick Family Foundation as a way to continually give back and included in that is partnering with other like-minded brands and companies to do good together. Here’s what we’re happy to share with people this month. One of our supplier partners, Finnegans, has a unique missions statement: turning beer into food. The Minneapolis-based brewery believes in 100% philanthropy and donates every penny of their profits to alleviate hunger in local communities, hence, turning beer into food. Finnegans wins two ways. The beer they brew is great, and the cause they support is greater. 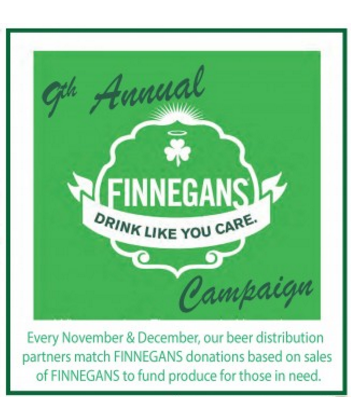 Each November and December, Finnegans supports a holiday tradition with their campaign, Drink Like You Care. This initiative, in its 9th year, doubles the charity effort by including distributors partners in a match of all Finnegans sales through the end of the year. As part of our mission to encourage and support communities, we created the Bernick’s Family Fitness Series. We highlight four seasonally-themed events outdoors during each of Central Minnesota’s beautiful seasons to encourage individuals and families to make health a priority year-round, no matter what it’s doing outside. We make each event into a celebration complete with live music, snacks and beverages, entertainment, kids’ activities, swag, and childcare. There is still time to register for the Thanksgiving Day Wishbone Walk or Run, sponsored by CentraCare. Register by tomorrow, November 5th, to receive a free t-shirt with each entry! The race will be Thursday, November 26th from 8am-10am. Join us! Another attribute that makes us so successful is the people and companies we partner with to further strengthen the communities we promote. Bernick’s Family Fitness Series, established in 2011, is presented by the St. Cloud YMCA in conjunction with 104.7 KCLD and Times Media. Strength in numbers! We’re grateful to have the support, and look forward to many more years of improving the health and wellness of families everywhere. We are a century-old company built on our founders’ belief that a vital community is one of the richest assets a company can have. Our tradition of responding to community needs and being a company synonymous with giving is a legacy we’re honored to carry on, year after year. We focus our support on two key areas – youth and education and health and fitness. Our physical footprint of territories we support can be found here. We encourage all eligible recipients including nonprofits, schools, and government entities to apply – the first step is asking! Here are some of the main organizations we’ve supported in 2015. We can’t wait to make this list grow in 2016 and beyond. Let us know how we can help.